MailEnable Enterprise Premium features fully integrated Outlook components for mail, calendaring, contacts, and collaboration. The new MAPI solution provides complete integration between the MailEnable server and Microsoft's Outlook email and office productivity client. Supporting all the rich features offered in Outlook, including appointment scheduling, free and busy status, Public Folders, and access to shared account resources, this offers businesses all the power they need for efficient coordination and communication. 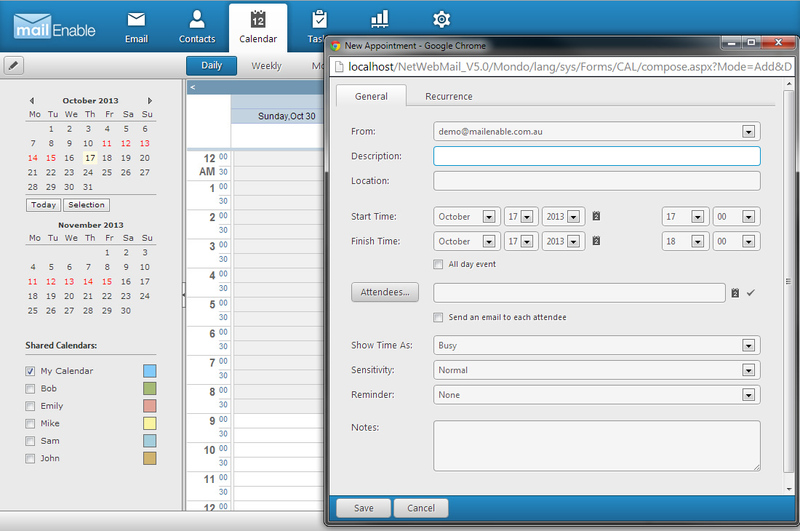 As mentioned above, calendaring integration is one important advantage of a MAPI solution. To extend on that for the corporate scenario, Outlook supports meeting invitations. You can schedule a meeting with others in the office, and they will receive an invitation in their inbox. They then have the option to deny your invitation, suggest another time that suits them better, or accept, in which case the appointment is immediately added in to their calendar. 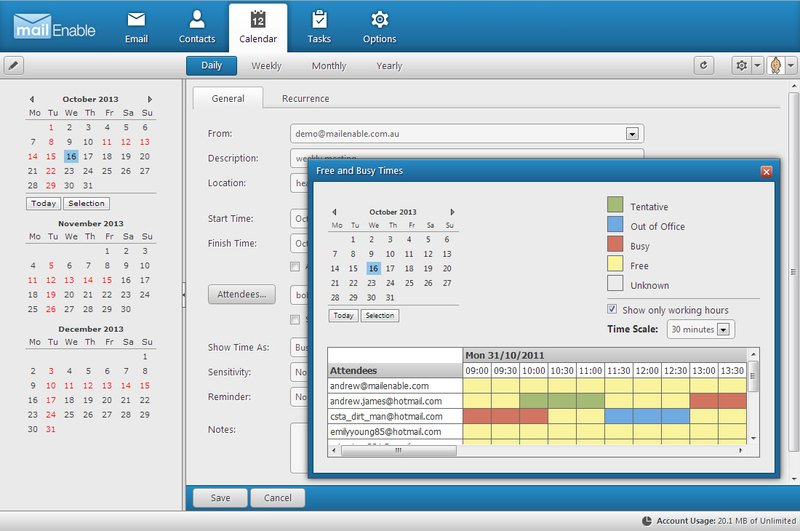 From your meeting invitation in your calendar, you can track the responses of the participants you sent invitations to. See how many people you are expecting, and whether a critical person is unable to attend so you can reschedule if necessary. When you are scheduling a meeting with a group of people, it can be difficult to find a time that works for everyone, but the MAPI solution makes it as easy as possible. The MailEnable server can communicate with Outlook to present to you a view of the free and busy status of all the attendees, so you can find a time slot where everyone is free, without having to go through the tedious, frustrating and lengthy process of sending out the invitations, waiting for the responses, suggesting alternative times, and rescheduling repeatedly. This is particularly useful for viewing another person's shared calendar. 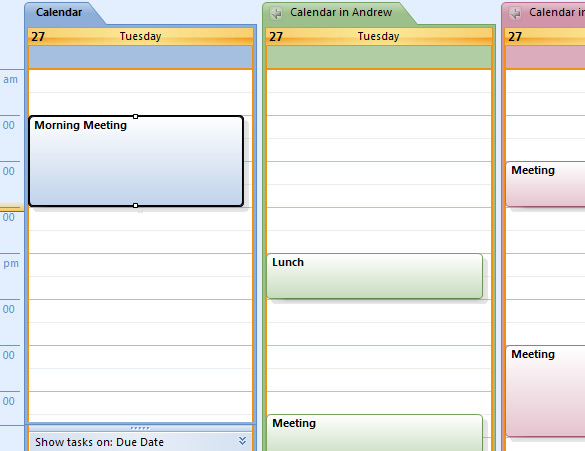 Outlook supports different ways of viewing multiple calendars simultaneously, including viewing them side by side, or overlaid, with different colouring to identify the different calendars. 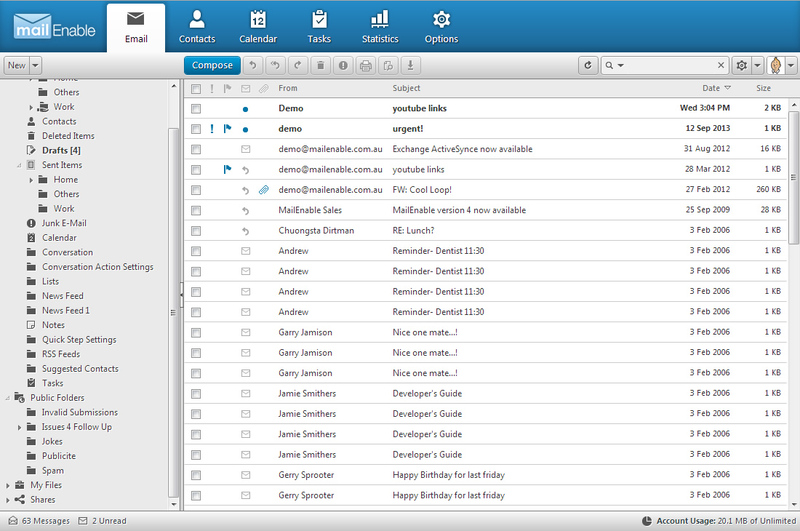 My Files is a server hosted file storage feature available from MailEnable Professional Edition and Enterprise Edition. The MAPI connector integrates with this feature, providing access through Outlook to your My Files storage on the server. Your files will be listed in Outlook, with easy preview capability of most file types, including images, video, audio and office documents. Perhaps the best thing about this feature is the ease of uploading files from your desktop computer to the mail server, via Outlook. You can simply drag and drop a file from your computer disk onto the My Files store in Outlook to send it to your mail account. If you have just imported a set of photos from your digital camera onto your computer, you can select them all, and with one drag of the mouse, host them all on your My Files area. And of course, when you connect to your account in Webmail, all your newly uploaded files will appear there.